Home/EltaMD/EltaMD Moisture-Rich Body Crème 2fl oz. Luxurious, ceramide-enhanced formula with enzymes promotes a healthy skin barrier. Moisturizes and nourishes dry, flaky, sensitive skin with moisture-binding hyaluronic acid, plant-based lipids and mango seed butter. Niacinamide and enzymes work to help smooth and soothe severely dry skin. For best results, apply daily and immediately after bathing. Follow with EltaMD sunscreen as directed by a physician. Purified Water, Ethylhexyl Isononanoate, Glycerin, Caprylic/Capric Triglyceride, Cetyl Alcohol, Stearic Acid, Glyceryl Stearate, PEG-100 Stearate, Mangifera Indica (Mango) Seed Butter, Dimethicone, Niacinamide, Ceramide NP, Isocetyl Alcohol, Hydroxyethyl Acrylate/Sodium Acryloyldimethyl Taurate Copolymer, Xylitylglucoside, Hyaluronic Acid, Squalane, Anhydroxylitol, PEG-7 Trimethylolpropane Coconut Ether, Polyisobutene, Actinidia Chinensis (Kiwi) Fruit Extract, Bromelain, Tocopheryl Acetate, Xylitol, Ficin, Glutamine, Biotin, Proline, Carbomer, Citric Acid, Sodium Hydroxide, Butylene Glycol, Phenoxyethanol, Farnesol, Sodium Bisulfite, Disodium EDTA. 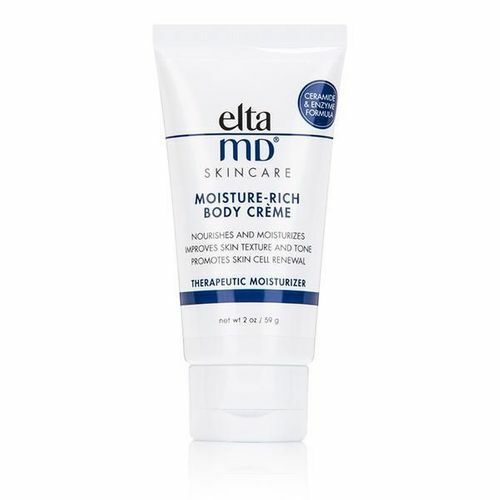 EltaMD Moisture-Rich Body CrÃ¨me 2fl oz.